An organization historically known for producing high-end pitching, the Mets switched gears and graduated their two best hitting prospects to the bigs in 2017. 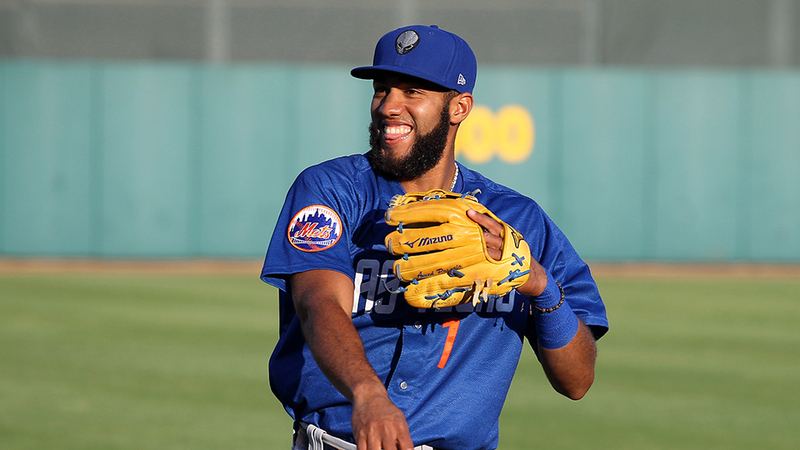 Amed Rosario and Dominic Smith formed a strong one-two punch atop the lineup for Triple-A Las Vegas, and both were rewarded with one-way tickets to New York in the latter part of the season. With both players officially in "The Show," the organization's next wave of talent has taken on a decidedly different look. While pitching prospects Corey Oswalt, P.J. Conlon and Chris Flexen all showed promise in Double-A, the Mets hope to sprinkle in a few more impact bats to compliment Rosario and Smith. Though the organization's depth took a dip after a series of promotions and trades culminated in a World Series appearance in 2015 and a spot in the National League Wild Card game a year later, a new and emerging crop of youngsters showed this past season that the well is far from dry. Catcher -- Kevin Plawecki, Las Vegas (64 games), New York (37 games): An Organization All-Star in 2013 and 2014, Plawecki earns a third nomination after batting .328/.375/.514 in 64 Triple-A games. The 26-year-old rediscovered his power stroke in 2017, amassing 28 extra-base hits and 45 RBIs in 247 at-bats with Las Vegas. The Illinois native hit .303/.411/.474 with three homers in his last 27 games of the season after returning to New York on Aug. 19. First baseman -- Dominic Smith, Las Vegas (114 games), New York (49 games): Smith began the year with four multi-hit efforts in his first six games for Las Vegas, which proved to be a sign of things to come. The 22-year-old put together a .330/.386/.519 slash line in his first taste of Triple-A and answered questions about his power potential by slugging a career-high 16 homers. Smith was promoted to the Majors on Aug. 9 and struggled during his time with the Mets, although he did swat nine home runs in 49 big league games. "I want to improve every year in every category, but the power was the one thing I really wanted to showcase," Smith told MiLB.com prior to the season. "It really took me until  to get my swing in tune with my body and learn how to be a solid run producer. It's like a game of chess: you pick your spots to do damage with the long ball. I wanted to develop and drive balls all over the field but also play the cat-and-mouse game of picking spots to do maximum damage; in the past, I didn't do that. I'm looking to drive the ball with authority in certain situations as opposed to just getting a hit." Second baseman -- Luis Guillorme, Binghamton (128 games): Possessing one of the smoothest gloves in the Minors, Guillorme continued to split time between shortstop and second base in 2017. The move to the Double-A Eastern League agreed with the 23-year-old, who bounced back from a subpar offensive season to bat .283 with a career-high 72 walks and 20 doubles in 124 games. The No. 11 Mets prospect made more appearances at second base -- 72 -- than at short for the first time since beginning his pro career in 2013. Third baseman -- Jhoan Urena, St. Lucie (122 games), Las Vegas (eight games): A season that began in the Class A Advanced Florida State League ended with a late-season promotion to Triple-A for the 22-year-old. After struggling to a .225 average with St. Lucie in 2016, the Mets' No. 15 prospect returned to Florida this past season and responded by hitting .282/.364/.437 with 47 extra-base hits -- including a career-high 11 homers -- and 62 RBIs in 122 games. He slugged three more roundtrippers in 13 games with Las Vegas. Shortstop -- Amed Rosario, Las Vegas (94 games), New York (46 games): The crown jewel of the Mets' system made his long-awaited Major League debut in 2017 on the heels of another All-Star campaign. The 21-year-old got off to a scorching start and wound up collecting two or more hits in 42 of his 94 games with Las Vegas, including a streak of six consecutive multi-hit efforts. Rosario batted .328/.367/.466 with 58 RBIs and 19 stolen bases for the 51s and was promoted to the Mets on Aug. 1. He finished with a .248 average and 12 extra-base hits in 46 big league games. "We hope and anticipate that he'll continue to progress," Mets Minor League field coordinator Kevin Morgan told MiLB.com last spring. "He performed well in  big league camp. We just want him to continue to focus on the process, keep him progressing and moving forward." Outfielders -- Travis Taijeron, Las Vegas (125 games), New York (26 games): Taijeron reached the 20-homer plateau for the third time in his career in 2017 and was rewarded with his first trip to the big leagues. Starting in Las Vegas for a third consecutive year, the 28-year-old was a key cog in the 51s' offense, hitting .272/.383/.525 while matching his personal best with 25 homers and driving in 78 runs. Taijeron made his Major League debut on Aug. 26 after playing in nearly 800 games over seven Minor League seasons. Wagner Lagrange, Kingsport (45 games), Brooklyn (13 games): In just his second season in the United States, Lagrange made the move from the Mets' Rookie-level Gulf Coast League squad to the Appalachian League with impressive results. After hitting .231 in the GCL in 2016, the 22-year-old batted .335/.379/.465 with 40 RBIs in 45 games for Kingsport before he moved up to Class A Short Season Brooklyn. Overall, Lagrange put together a .330/.379/.460 slash line to go along with 18 extra-base hits in 58 games in 2017. Kevin Kaczmarski, Binghamton (128 games): Making the move to Double-A in 2017, Kaczmarski was a mainstay in the Rumble Ponies' lineup while playing all three outfield positions. The 25-year-old's offense has been remarkably consistent since he was selected in the ninth round of the 2015 Draft from the University of Evansville. A career .295 hitter, Kaczmarski batted .274/.370/.379 with 15 stolen bases during his first season in the Eastern League. Designated hitter -- Peter Alonso, St. Lucie (82 games), Binghamton (11 games): The Mets' seventh-ranked prospect had his pro debut interrupted by a broken finger one month after starting his career last year. A fractured hand just one week into 2017 sent Alonso to the disabled list for six weeks, but he showed no ill-effects after returning in late May. The 22-year-old first baseman put together a .286/.361/.516 slash line with 16 homers in 82 games for Class A Advanced St. Lucie. Alonso never slowed down after his promotion to Double-A Binghamton, where he batted .311 with a pair of home runs in 11 games for the Rumble Ponies. Right-handed starting pitcher -- Corey Oswalt, Binghamton (24 starts): Oswalt established career highs across the board in his first Double-A campaign. The No. 27 Mets prospect won a career-high 12 games and led the circuit with a 2.28 ERA while striking out 119 over 134 1/3 innings. His performance helped earn him Eastern League Pitcher of the Year honors as well as a spot on both the midseason and postseason All-Star teams. "He put everything together this year," said Glenn Abbott, who will become the pitching coach for Triple-A Las Vegas in 2018 after spending this season with Binghamton. "He worked on a few things with his delivery early in the season, and it made a huge difference with his command. That in turn bred confidence, and away he went. All of his pitches improved. His curveball, his fastball and his slider, which is still a work in progress, showed improvement by the end of the season and has a chance to be a nice pitch for him. Corey just had a great year." Left-handed starting pitcher -- P.J. Conlon, Binghamton (28 games, 22 starts): Born in Northern Ireland, Conlon followed up a tremendous 2016 with another strong campaign this past season. Although he failed to duplicate his 1.65 ERA of a year ago, the 24-year-old appeared in a career-high 28 games and posted a 3.38 ERA for Binghamton. Known more for his control than his ability to overpower hitters, Conlon has a career 245-to-64 strikeout-to-walk ratio and is averaging less than two free passes per nine innings over his three years as a professional. "P.J. did a really nice job for us this year," Abbott said. "He changes speeds well, uses both sides of the plate and has a large amount of confidence. He's a typical left-hander in many ways, meaning he doesn't throw too hard but changes speeds very effectively and has terrific control and command. He's not afraid to throw all of his pitches at any time and can do so consistently for strikes." Relief pitcher -- Adonis Uceta, Columbia (29 games), St. Lucie (eight games), Binghamton (four games): To say Uceta came out of nowhere in 2017 would be a bit unfair, but a move to the bullpen provided eye-popping results for the 23-year-old. A starter in 35 of his first 53 career appearances, Uceta pitched exclusively in relief this past season and posted a 1.51 ERA. He also won six games and finished 14-for-14 in save opportunities between Class A Columbia, St. Lucie and Binghamton, holding the opposition to a .166 average while punching out 67 batters in 59 2/3 innings. "I only had Adonis at the very end of the year, but he's got a big arm," said Abbott. "He pitched very well with Columbia and St. Lucie and just really came on strong. He's got a little funk in his delivery that helps throw off the hitters. During the time we had him [in Binghamton], his command wasn't as good as it had been, but that comes with experience, which is what he needs now. He's got a bright future."